Sun poisoning? (1) Is there really such a thing? No there isn’t, not in the sense that you’re actually poisoned. What it does refer to, in a colloquial manner, is a severe sunburn. Depending on how strong the ultraviolet radiation (UV) is on a given day, you could potentially burn in the sun in only 15 minutes. That’s why it’s crucial to use sunblock when outdoors—even better, apply it before heading outdoors. The symptoms of sun poisoning start off like a sunburn, but progress further. You might start to feel dizzy, have bouts of nausea, or have a headache (to name a few), along with a rash. It’s important to note that symptoms of sunstroke are different from sun poisoning and sunburn. Sunstroke has more to do with your body overheating from being out in hot temperatures; sun poisoning is, as mentioned, a severe sunburn. Though heat is a common thread, the conditions are not the same. Some people even experience the symptoms of a sun allergy, where they get itchy and break out into a rash if exposed to the sun. It’s possible to have an allergic reaction to the sun, and this is another kind of sun poisoning resulting in photodermatitis (an abnormal skin reaction to sunlight). Sun poisoning is not good for the skin and can lead to skin cancer (2), but developing cancer depends on many factors including genetic makeup and environment. 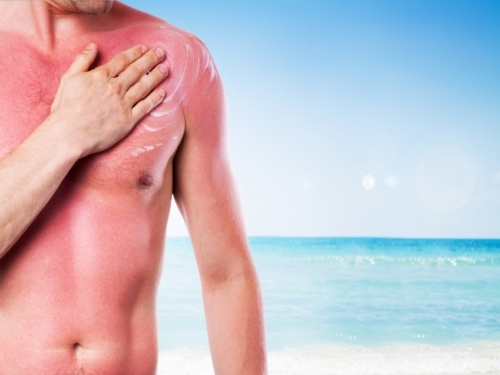 One of the more obvious symptoms of sun poisoning is a rash with accompanying itchiness. Whatever you do, don’t scratch it because the skin is already damaged and inflamed, and susceptible to infection if the skin is torn. The skin needs to be hydrated, and applying a soothing application of a gel (aloe vera, for example) is also a good idea. 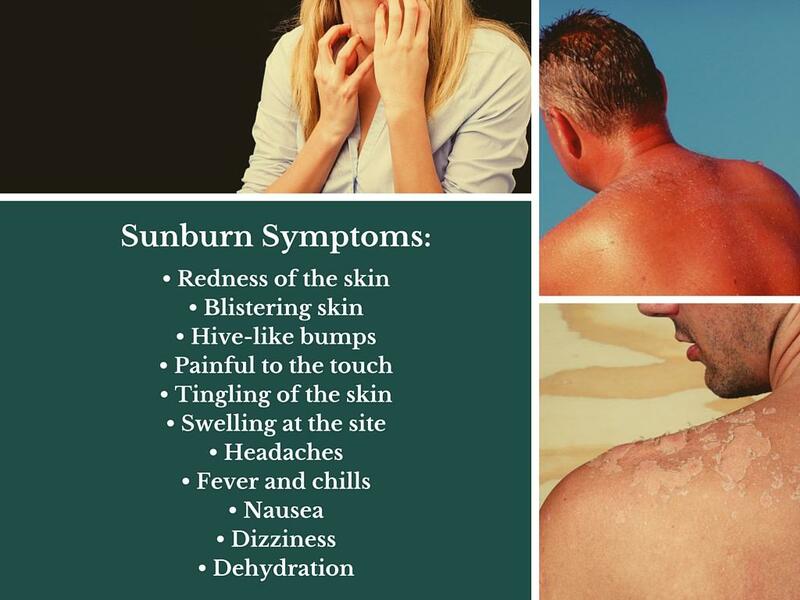 The symptoms of a sun allergy are the same as the ones listed above for sun poisoning, since, as mentioned, the allergy is a form of sun poisoning. Don’t be alarmed if one of the symptoms of sun poisoning is on the lips. The lips are made of very thin skin that can be easily damaged, and that includes overexposure to the sun. Don’t panic if they start to blister. Apply something cool to them as soon as possible to help reduce the swelling. Then apply coconut oil, if possible; it will hydrate the lips and provide essential fatty acids and nutrients to help them heal. Symptoms of sun poisoning in children are the same as they are for adults, but children might experience them quicker and with more intensity. Be sure to watch their hydration levels and continuously apply sunblock with a high sun protection factor (SPF). If possible, have them take periodic breaks indoors, or at least in shaded areas. Treatment of sun poisoning involves two parts: getting out of the sun and then rehydrating your body both internally and externally. Get out of the sun immediately. It’s better if you can get inside somewhere and cool down properly, but if the best you can do is find shade, then get to that shaded area right away. Take a cool—not cold—shower or bath. Drink plenty of fluids for a few days (4). Ensure a few of these have electrolytes in them so your body gets rebalanced. Take ibuprofen or acetaminophen if there is any associated pain with the burn. Use aloe vera gel or a gentle moisturizer. Cover up the sunburned areas when going outside. Make sure the area is complete covered, as the skin is tender and you don’t want to risk any further damage. Apply a thin layer of full-fat plain yogurt to the sun-poisoned skin. Yogurt cools the skin and has fats in it that will return moisture to the skin. Apply a thin layer of full-fat plain yogurt to the sun-poisoned skin and allow it to sit for 20 to 30 minutes. Wipe off gently with a cloth. 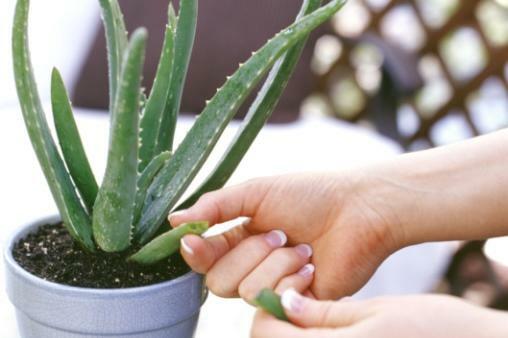 If you have an aloe vera plant on hand, snap one of its leaves off and remove the gel. Apply this to the skin by rubbing it in gently. Aloe vera has been used for centuries as a remedy for skin ailments, including sunburns, because of its soothing and hydrating properties. If you have the plant on hand, snap one of its leaves off and remove the gel. Apply this to the skin by rubbing it in gently. Don’t worry about wiping it off, as you want it to soak in and stay on. 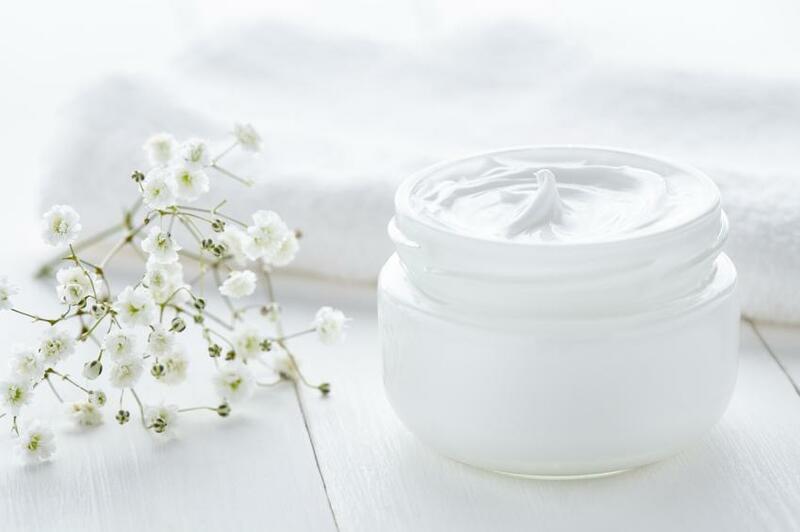 Rosehip seed oil can be used after yogurt application to help seal in moisture. 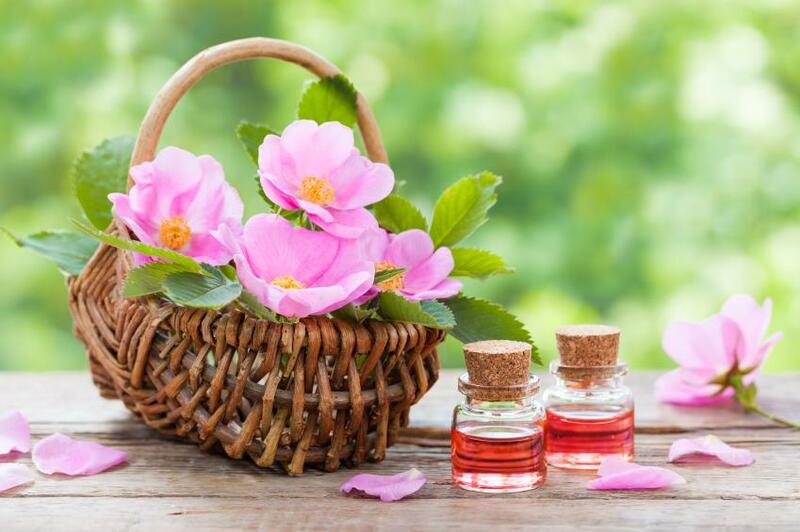 Rosehip seed oil is made up of 77% essential fatty acids, so it’s incredibly hydrating for the skin. It also has vitamins and nutrients that help restore the skin’s balance. It’s pricey compared to aloe vera and yogurt, but it’s an important natural remedy that can help heal truly sun-damaged skin. It can be used after the yogurt application to help seal in moisture provided from that. Rub the oil into the skin a few times a day until healed. 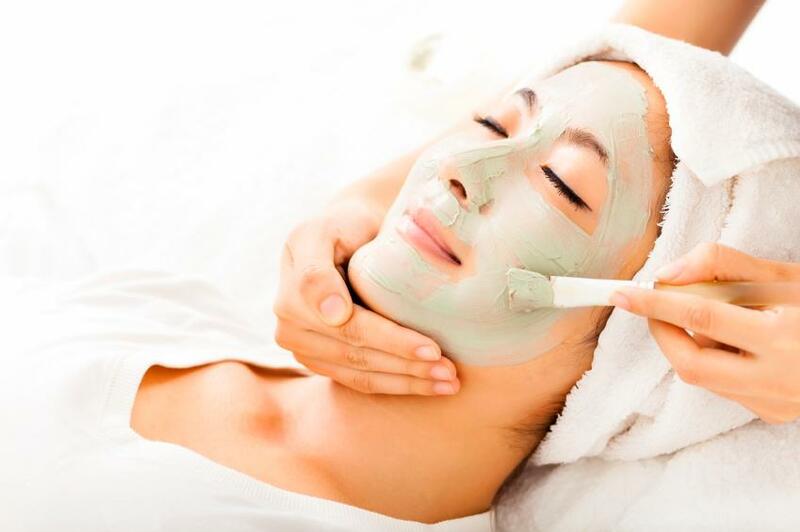 Take some cold cucumbers, blend them up into a paste, and apply it to the affected skin. Cucumber is soothing and hydrating, and can help calm down inflamed, sunburned skin. It’s safe to use on severely damaged skin (unless there are open blisters, in which case please seek medical attention). The best way to use this is to take some cold cucumbers, blend them up into a paste, and apply it to the affected skin. Allow it to sit for 30 minutes. Gently wipe it off, but don’t remove all of it, as the juice will continue to heal and soothe. Simple common sense will help you avoid getting sun poisoning. Because this condition erupts with overexposure to the sun, you need to be mindful of how much time you spend outside during peak hours (between 10:00 a.m. and 4:00 p.m., when the sun’s rays are at their most intense). Some people have a zero tolerance for any sun and will get sunburned easily, so they need to cover up when they go outside, even for five minutes. Wide brimmed hats, long-sleeved shirts, pants, and shoes will protect the skin from exposure. Dehydration can happen rapidly on hot days, especially if the humidity is high. Make sure to have water on hand and drink every 15 minutes just to be safe—if you feel thirsty, you’re already dehydrated. The amount everyone needs is different, based on weight and how much you perspire. Drinking water is great, but it’s better to have a sports drink that can replenish electrolytes. With a little common sense and by employing some preventative measures, you can avoid the symptoms of sun poisoning. Avoid activities outside when the sun is at its hottest, or, if you have to go out, stay covered up and in the shade.